I got rid of the very things that have been holding me back in motherhood. And by things, I mean clothes. Clothes that no longer serve the body that I currently have. The body that has brought five beautiful babies into this world. There is no denying how my body has changed through the process of growing, birthing, and feeding babies for the past 9 years - and how could I expect it to go back to what it was before all of this was possible? Somehow, I’ve managed to hang on to a wardrobe from my pre-baby years, thinking I would somehow come back to these clothes again. But you know what? Having a closet full of clothes from the past that don’t fit where my body is presently had been taking up way too much space - in my closet and in my head. 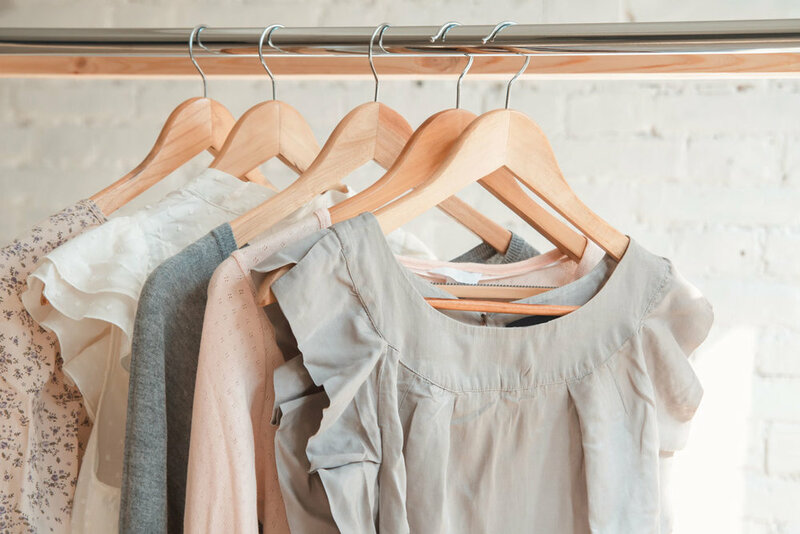 Getting dressed in the morning could be a negative trigger for the rest of my day - especially when my choices were between those clothes that didn’t quite fit (but might one day?) or those leggings I’ve been wearing from the past week (you know, the ones with spit-up). Talk about a blow to my body image and self-esteem. Each and every day. So I finally parted ways, for good. And you know what? I’ve never felt more free. Free to play with my kids in clothes that actually fit well - not just on my body, but in this season of life. Free to spend more time focusing on being with my babies rather than feeling preoccupied with negative thoughts about my body. Free to dress in a way that allows me to celebrate where I am rather than feel discouraged or uncomfortable in my own skin. Free to celebrate the body I’m in NOW; this body that has been transformed because it brought me my children and grew us a family. I grew tired of walking into my closet full of clothes but feeling like I had nothing to wear. I became weary of resorting to the same pair of yoga pants and sweatshirt, only because I knew they would fit. I was sick of not doing my postpartum body justice by wearing clothes that better fit my changing body. So I finally did something about it. Does it fit my body currently? Do I love this clothing item, including the style, pattern, and how it fits my body? Does it work with this season of life I’m in now (work at home mamas - I’m looking at you)? Clothes that didn’t make the cut were no longer allowed to take up space in my closet (or in my head). That included shirts that didn’t quite fit, gaped, or hugged my postpartum belly in ways that felt uncomfortable. Those jeans that I used to love but just didn’t quite button or felt too tight. Dresses that no longer made me feel like the postpartum goddess I am (hot mess and all) - I got rid of them. I said goodbye. I created a donate pile, which I gave away to local consignment stores. I also gave clothes away to family and friends. And you know what? I haven’t missed them one bit. In fact, this postpartum closet edit has saved my motherhood. This simple step meant proactively making the choice to bring up my children in an environment of self-love. It’s a boost of confidence to myself and an empowering act of kindness toward my body that has enabled me to live the best version of who I am NOW - for myself and my kids. In many ways, the clothes we choose to put on our bodies symbolize the relationship we have with ourselves. Do you feel like you deserve to take care of yourself? Do you feel like you have to wait to reach a certain weight or size to begin participating in life? Life is not going to wait for you. And your body will constantly change throughout the course of your life - that is a fact. Embracing where you are now does not mean you are somehow letting yourself go. It means you are making space for yourself to live life on your terms, not based on the number on your clothing tags or on the scale. It means choosing to respect and honor who you are and show an appreciation and gratitude toward your body for all that it has brought you through and done for you. Motherhood shouldn't be confined by clothes that don't honor your postpartum body. You know what they say, mama - babies don’t keep. I knew that I didn’t want to put life on hold anymore or let countless moments go by because I couldn’t make peace with my body. I want my kids to know that they are free to be who they are and learn from a mama who is confident in her own skin. Because one day, they are going to grow up, and I want them to know they should always respect and care for themselves - no matter their journey. Not because I tell them too but because I show them from loving myself well. Life is too short to wear clothes that don’t fit or to be at constant war with ourselves. Getting rid of clothes that no longer work is a physical and tangible way of saying goodbye to my former self, who I was before I had my babies. And as hard as it can be, trying to go back to that time would mean not having my babies here with me. Our bodies rightfully change through the transformative journey of pregnancy and birth. Choosing to wear clothes that fit my body doesn’t mean I can't care about who I am; it's taking proactive steps to be kind to myself exactly as I am. That means wearing clothes that fit and feel good on my body, not punishing myself by trying to squeeze into something that no longer fits. That is something that feels good and is worth doing. You can do it for yourself too. You can be caretaker for your body and start taking those powerful steps forward that allow you to be kinder to yourself, even if you can’t always love what you see in the mirror. Because your kids deserve a mama who isn’t consumed with self-loathing thoughts toward her body and you don’t deserve anything less. Get Your Free Guide: "5 Healthy Habits Every Mom Desires For Her Kids (That She Needs, Too)"
Sign up with your email to have your guide sent straight to your inbox. Learn More about intuitive eating coaching and body image healing for postpartum moms!